I recently read this article: http://www.cbsnews.com/news/supermoon-lunar-eclipse-coming-this-month/ I'm having some trouble understanding how a "supermoon" lunar eclipse is possible. 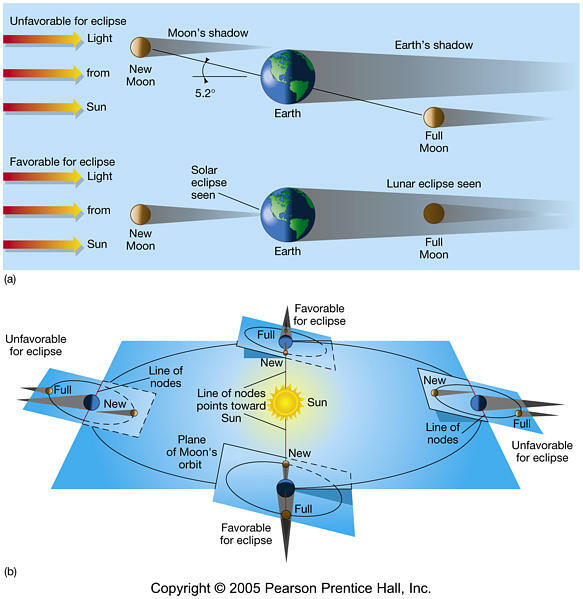 Judging from this diagram, it would seem that the moon always reaches its apsides above or below the orbital plane of the earth around the sun, making any kind of eclipse at these points impossible. Can someone clarify for me? Lunar Eclipses occur when a full moon occurs when the the moon crosses the ecliptic. The ecliptic is the plane in which the Earth orbits the sun, and so also the track which the sun appears to trace in the sky relative to the stars. It appears from the diagram that there are two nodes each month (ascending and descending), but this is only approximately correct. The influence of the sun causes the nodes to move.It takes 29.5 days between two full moons, but only 27.2 days between two ascending and descending nodes). This means that a node can occur on any day of the year, and any day of the month. A "supermoon" occurs when the moon when it is closest to the earth, the perigee. This point of perigee also moves, so the perigee can also occur at any time during the month, and the time of perigee is not related to the time of the node. Unlike terms like "node" which astro(nom|log)ers have used for many years, Supermoon is a neologism. Thus is is possible, but rare for a full moon, a lunar node, and a perigee to occur at about the same time, and if it does, a supermoon eclipse will occur. Not the answer you're looking for? Browse other questions tagged orbit the-moon lunar-eclipse or ask your own question. Which is more rare: Lunar eclipse or Solar eclipse? Has anyone filmed a total lunar eclipse from the Moon's perspective? Lunar Eclipse - Total darkness? How much longer is this (July 27th 2018) lunar eclipse than others? Why was the July 27th 2018 lunar eclipse not visible in North America?